This collection of six stamps features six sensational images, commissioned exclusively for these eye catching stamps, capturing the beauty and elegance of Justin Thornton and Thea Bregazzi's work perfectly. Each of the stamps is dedicated to one of Preen by Thornton Bregazzi's most iconic pieces including the Red Finella Dress as worn by the Duchess of Cambridge during the 2016 Royal Tour of Canada, their Stripe Flintoff Dress which graced the cover of Vogue and their most popular dress, the Citrus Power Dress as worn by Amy Winehouse and Gwyneth Paltrow. The Quilted Florals Dress from Preen's Autumn-Winter 2017 collection is featured, along with their Pink Velvet Hitch Dress from their Autumn-Winter 2016 collection which personified the season. To be the first to hear exclusive updates on this collaboration, make sure you sign up to our Front Row mailing list by clicking here. Make sure you put Preen in the subject line and your name in the body of the email and we will be in touch in due course. Preen by Thornton Bregazzi was founded in 1996 by fashion designers Justin Thornton and Thea Bregazzi. The designers, who met whilst studying the art foundation course at the Isle of Man College, are two of the Isle of Man's most talented and successful individuals who have built a phenomenal career in the fashion industry. Their debut collection at London Fashion Week for Spring Summer 2001 was met with rave reviews and established the brand's essence of "punkish sensibilities with vintage elements and hand crafted details". Preen has evolved from a small boutique in London's Notting Hill to a leader in the fashion world, collating a legion of loyal, famous faces to flaunt their collections along the way. These include Beyoncé, Scarlett Johansson, and Michelle Obama to name but a few. This unique collaboration is a stand out range from the Isle of Man Post Office, utilising Preen's famed use of colour which is inspired by the raw beauty of the Island where they were raised. The stamps are bold, striking and spectacular and a must have for anyone who appreciates fashion and design or is looking for something original for their stamp collections . The Isle of Man Post Office and the Manx Breast Cancer Support Group will be auctioning a dress designed by Preen by Thornton Bregazzi, to celebrate women's collective success and raise funds for the Charity. The Finella dress designed by Preen is featured on an Isle of Man stamp, and the Duchess of Cambridge has been seen to wear this stunning design during her state visit to Canada in 2016. This midi dress is crafted using Preen's signature TED body sculpting matte stretch satin and features an asymmetric sweetheart neckline, fitted waist and full mid-length skirt. 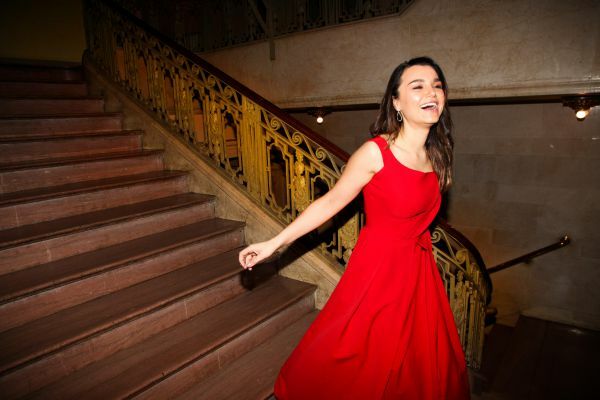 The Finella dress that will be auctioned is the actual dress worn by Samantha Barks, an award-winning Manx singer and actress, widely acclaimed for her role in the movie Les Miserables (2012). Samantha, soon to star as Vivian in Pretty Woman: The Musical, based on the film of the same name which is debuting in Chicago on 13th March 2018, said, "I have had the most fun wearing this beautiful red dress by Preen. Good luck to everyone taking part in the auction and I hope we are able to raise a lot of funds for the Manx Breast Cancer Support Group, a vital charity that does impactful and admirable work to improve the breast cancer service on the Isle of Man." The complete set of Preen by Thornton-Bregazzi stamps are presented on a luxury envelope. Each of the stamps is dedicated to one of their most iconic pieces including the Red Finella Dress as worn by the Duchess of Cambridge during the 2016 Royal Tour of Canada, their Stripe Flintoff Dress which graced the cover of Vogue and their most popular dress, the Citrus Power Dress as worn by Amy Winehouse and Gwyneth Paltrow. The Quilted Florals Dress from Preen's Autumn-Winter 2017 collection is featured, along with their Pink Velvet Hitch Dress from their Autumn-Winter 2016 collection which personified the season. The stamps are cancelled with a unique postmark dated for the first day of issue (01.02.2018) and this elegant collectable is completed with a filler card with illuminating text from the designers, Justin Thornton and Thea Bregazzi, telling the story of their iconic brand. We are still collaborating with Preen on the design of this cover. The beauty of this standout stamp collection is brought to life through this four page glossy, full colour booklet with commentary from the team at Preen by Thornton Bregazzi. Containing a full set of these striking yet elegant mint condition stamps, this album is full of supplementary images and text from the designers giving an insight in to the inspiration behind their most iconic garments. A vibrant set of six stamps showcasing Preen by Thornton Bregazzi’s most iconic dresses from their twenty year career in the fashion industry. The images for these stamps were commissioned exclusively for this collection. The model is situated in a box to give the impression that she is inside the stamp. The pictures were shot with a soft focus so that the final images appear almost feel painted. The choice of a red haired model was inspired by Thea's Bregazzi's trademark hair. This show stopping collectable presents a mint set of stamps from the Preen by Thornton Bregazzi stamp issue, beautifully presented in a classic black frame. A large framed stamp of the Preen by Thornton Bregazzi RoW value which features the Pink Velvet Hitch dress from their Autumn/Winter 2016 collection which personified the season.